ACC Liverpool will be promoting the city to event buyers at this week's EIBTM in Barcelona, as well as unveiling the venue's expansion plans. 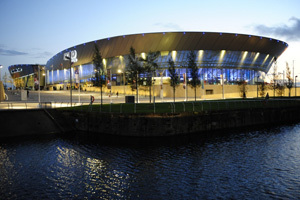 The ACC, home to the BT Convention Centre and Echo Arena, will be promoting the city using the slogan ‘It’s Liverpool’. A team from the conference centre will use the event trade show to talk about the development of the Exhibition Centre, which is due for completion in 2014. The new space will offer event organisers up to 8,100sqm of space. "We are rounding up the year by welcoming the Beatles’ Paul McCartney for the final leg of his world tour and looking forward to welcoming Association Congress next summer and thereafter the build of the additional space in 2013. We are eager to share these messages to more buyers at EIBTM and see new demand come forward for our spaces over the next year." MacPhie will give a presentation on Wednesday 30 November at 1.15pm. ACC will be exhibiting on the Visit England Pavilion G270 at EIBTM.